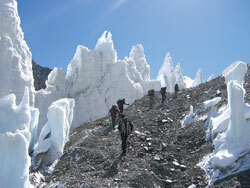 MAGIC HIGHWAY: These ice towers on the Rongbuk Galcier on the north side of Chomolungma were twice as big 20 years ago. The Khumbu Icefall on the southside of the mountain (below) has also become easier to traverse because the seracs are smaller. Global climate change is affecting the Himalaya much faster than previously thought, and mountaineers have been the first to notice the changes: more frequent avalanches, more crevasses and exposed rock faces where there used to be snowfields. Cho Oyu and Chomolungma used to be considered the easiest of the eight-thousanders to climb, but have become more difficult in the past 25 years. "There are certainly more crevasses than there used to be on Cho Oyu and climbers have to take a new steeper route than before," says Phil Crampton, who has been leading expeditions to Cho Oyo and Chomolungma for the past seven years. Mike Roberts, a mountain guide from New Zealand, has also seen changes on the mountain: "I think the upper section of Cho Oyo is getting steeper and more difficult, and expeditions will have to start putting ropes there." At 8,201m, Cho Oyu is the sixth highest mountain in the world, and this year hasn't been kind to mountaineers. Normally the success rate on the mountain is relatively higher than other mountains, but this year most expeditions had to turn back due to bad weather. Mountaineers have also noticed a change in weather patterns, with more frequent late monsoon storms. Russell Brice, a guide from New Zealand, says: "Even though the last two monsoon seasons were very heavy, there was hardly any deposit of snow on Cho Oyu." New Zealander Russell Brice first went to the Tibetan side of Chomolungma 20 years ago, and he thinks that the mountain has become drier. "In 1988 I was climbing on green ice to gain access to the northeast ridge, today it is shingle scree," he says. The route to the North Col at 7,000 m has also become more difficult as two or three crevasses now block the way. On the area leading up to the bottom of the col there are now small lakes and ice slush rivers forming during the spring season, says Brice. The ice walls of the 'Magic Highway' leading to Advanced Base Camp are now half the size of what they used to be 20 years ago. On the Nepal side, Chomolungma has also changed dramatically since Edmund Hillary and Tenzing Norgay first climbed it in 1953. "When my colleague Guy Cotter first guided an expedition to Everest the Hillary Step was completely covered in snow and ice.in 2004 it was just rock," says Mike Roberts, who has led expeditions to Everest since 2002. "The entire stretch from the south summit to the true summit is now pure rock." But both Roberts and Brice think that the Khumbu Icefall has actually become safer in the past few years. This could be because of 'Icefall Doctors' (Sherpas who fix ropes and the ladders) or due to global warming. Says Brice: "The ice fall is probably moving faster now than it did about 20 years ago, and now it is not as steep, so I think that there is less serac fall." Pumori and Ama Dablam, on the other hand, have become more treacherous. A few years ago Pumori was considered one of the easiest 7,000-metre peaks but that has changed. Giampietro Verza, an Italian mountain guide who knows Ama Dablam well, says the mountain is no longer what it used to be since a huge block of ice broke away just above Camp 3 and swept six climbers to their deaths last November. "This spring there was hardly any snow on Ama Dablam, and climbers had to manoeuvre over rock in places that are normally an easy walk on snow," says Verza, "the mountain has become much more technical in the past few years." Ama Dablam at 6,812m is one of the most challenging and popular mountains in the Himalaya, but this spring none of the 14 teams climbing it via the normal southwest ridge succeeded: the first time since 1996 that nobody reached the top via the normal route in one season. The Ama Dablam glacier itself has retreated more than 500 metres in the past 50 years. The Imja Glacier below Lhotse is the fastest receding glacier in Nepal, and is melting at 70 m a year as seen in these pictures taken in 1956, 2006 and 2007 (above). The melting has created huge lakes on Imja Glacier which are expanding alarmingly, and scientists are concerned there will be catastrophic glacial lake outburst floods in future that could kill thousands of people downstream. The Kathmandu-based mountain research institute, ICIMOD, estimates that the Khumbu Glacier is also retreating at an average of 20m per year. The length of the glacier has shrunk from 12,040m in the 1960s to 11,200m in 2001 and Everest Base Camp has actually dropped from 5,320m to 5,280m since Hillary and Tenzing first set up camp there. 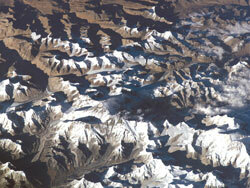 All these glaciers are seen in this NASA photograph of Chomolungma taken in 2000 from the Space Shuttle (right). Global average temperatures are rising at 0.06 degree a year, and scientists say snowlines especially of mountain regions close to the equator are most affected. But scientists at ICIMOD which monitors the Hindu Kush-Himalaya region says there isn't enough proof that receding snowlines are directly the result of climate change. "It is still too early to say," says ICIMOD glaciologist Pradeep Mool, "but if present trends continue most valley glaciers will have disappeared by 2050."